On January 12, 2015, the UN Committee on the Rights of the Child concluded its review of Iran’s third and fourth periodic reports on the implementation of the provisions of the Convention on the Rights of the Child. For two days UN committee members reviewed information received and asked questions about a wide variety of important topics ranging from child marriage to health and educational opportunities for children, including Afghan refugees. Iran is one of a handful of countries that still executes child offenders, or boys and girls under 18 years of age at the time they commit a crime. Iran’s judiciary continues to sentence child offenders to death, and carry out their execution by hanging, despite the fact that Iran adhered to the treaty in 1991 and its parliament ratified it three years later. In 2015 human rights groups documented at least three executions of child offenders, with at least 160 others awaiting the same fate on death row. During their response, Iranian officials spent a significant portion of their time asserting that changes in the country’s penal and criminal procedure codes in 2013 and 2015, respectively, and initiatives like the National Action Plan for Children implemented in 2009, have allowed judges more discretion in replacing death sentences for child offenders with other measures. 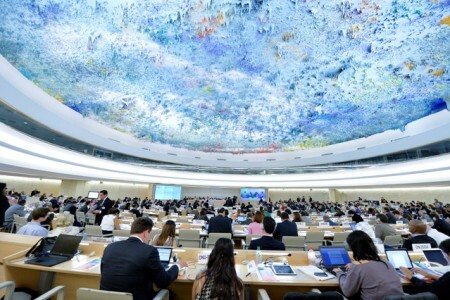 They noted, however, that more scientific studies conducted by experts and training are required to ensure that lawyers and judges consider the best interest of the child, acknowledged that change will not happen overnight, and cited their government’s decision to submit to committee review as proof of Iran’s willingness to constructively engage with UN human rights mechanisms. Notwithstanding the fact that the number of child offenders executed in 2014-15 are actually higher than at any time during the past five years, Iran should recognize that on an issue as important as this, cooperation and piecemeal reform are not enough. Though Iranian officials may quibble with the numbers cited by rights groups, they simply cannot sidestep the fact that Iran’s laws, as written, allow for the execution of child offenders. The bottom line is that today Iranian judges can, and have, sentenced girls as young as nine lunar years and boys as young as 15 lunar years to death by hanging, in plain violation one of the most fundamental and sacrosanct rights recognized under international law. This is why I join the members of the committee in calling on the government of Iran to take more drastic and immediate measures to ensure that from this day on no child offenders are executed in Iran, regardless of the nature of their crime. This requires issuing an immediate moratorium on all death sentences for child offenders. Ultimately, however, it means removing the general reservation that allows judges “the right not to apply any provisions or articles of the Convention that are incompatible with Islamic Laws and the international legislation in effect,” defining children as anyone under the age of 18, and raising the age of criminal responsibility. As one committee member noted the UN had already waited “a long time”—since at least 2005, the last time Iran submitted to committee review—to see serious and fundamental change with regard to the execution of child offenders. Until and unless this happens, it is difficult, if not impossible, to argue that the Iranian government is truly concerned about the best interests of its children.